a place for us to share ideas, talk about life, and learn together. This passage comes from a series of Jesusâ€™ teachings that range from prayer, the Golden Rule (which immediately precedes it), building oneâ€™s life on a solid foundation, etc. It is a warning to the church against false prophets. It begins with the warning to â€œbewareâ€ â€“ they should be aware that false prophets will come and want to be a part of their group. 1) those whose worship false gods and served idols, 2) those who falsely claimed to receive messages from the Lord, and 3) those who wandered from the truth and ceased to be true prophets. It is this last group of false prophets that are the most to be feared. They could have come to your group and been vetted, and even have been an esteemed leader, but over time their hearts have changed and they now have different motives and reasoning to be apart of a group of God followers. It is characteristic of this last group of false prophets to be employed by the powerful and rich and that they tell what these groups want to hear. They give flattering, positive, and pleasing words in their sermons, and are focused on being popular but give false messages (Jeremiah 28:1-17). The false prophet appears, on the outside, to be gentle and like everyone else around them, but on the inside are â€œravenous.â€ The greek word here translated as â€œravenousâ€ (á¼…ÏÏ€Î±Î³ÎµÏ‚) is used three times in the New Testament. Here in Matthew 7:15, Luke 18:11, and 1 Cor. 6:10. In the second two examples it is translated as “swindler,” and the first as “hungry, famished.” If you take into consideration all three examples it carries the idea of desiring to take and consume. The danger of allowing a false prophet into the fold is the resulting â€œdiseasedâ€ fruit (vv. 17-18). His messages sound appealing, popular, and pleasing to the hear, but they are void of truth and the resulting spiritual fruit in the lives of the congregation leads to disease. Before a prophet (teacher, leader, etc.) Is allowed into the flock to teach their â€œfruitâ€ of past leadership should be carefully inspected. 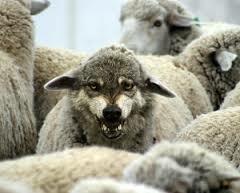 The wolf described here is incredibly hungry and desired to eat/consume the sheep. He wants what they have. The lost world or even those who have fallen away want what they see other believerâ€™s as having — they just donâ€™t understand how to have it in an acceptable way. In their lost or wayward condition they hate others for what they have and want to destroy them because of it. How Should One Respond to a False Prophet? Whereas the wolf sought to consume the sheep, in the end it is they whom are destroyed. So what should the group do when they realize they have a false prophet among their midst? 1. Cut the false prophet off from itâ€™s â€œroots.â€ Cut his influence down to the ground. His immediate separation from the group should be immediate. When you cut down and burn a diseased tree a new tree can be planted to take itâ€™s place. As long as the diseased tree is there in the orchard it takes/consumes sunlight, nutrients in the soil, space, etc. It has to go because it consumes needed elements from the trees around it. 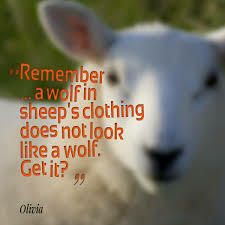 How Does One Protect Themselves From a Wolf In Sheep Clothing? 1. Take time to investigate â€“ donâ€™t assume. Jesus gives this teaching as a way of encouraging the church to compare His teachings, actions, and â€œfruitâ€ of His ministry to see if He is indeed a genuine prophet. 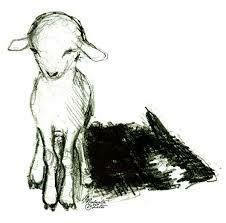 But it is also given as a warning to church to beware of false prophets. Once they are in the fold and amongst the flock the damage they inflict can be extremely devastating and life changing for the sheep they influence or consume. Ronald F. Youngblood, Gen. Ed., Nelson’s New Illustrated Bible Dictionary (Nashville, Tennessee; Nelson Publishing) 440. Drew Boswell wrote 615 articles on this blog. Dr. Drew Boswell is the children's pastor at First Baptist Church of Valdosta in Valdosta, Georgia. Contact me to kick things off. This will be more fun than a barrel of monkeys!